Everything from the meat and herbs, to the butter and rapeseed oil can be sourced here in Lincolnshire. Pop to your local farm shop and stock up with the ingredients listed below to recreate at home. Always buy your lamb from your local butcher, it’s locally sourced and it’s going to be a much better quality than buying off the shelf in your local supermarket. At this time of year, ask your butcher for English Spring Lamb, it’s the best season for it and packed full of flavour with a beautiful sweet taste. The beauty of buying from a butcher is they’ll prepare it to your requirements saving you that essential time when cooking! When buying your rumps, get your butcher to remove the main layer of fat, leaving the thin layer that’s attached to the meat along with the inedible sinew that’s on the underside. This layer of white fat won’t break down when cooking, and toughens up what would be a beautiful piece of lamb. Prepare your lamb the day before as it’s going to absorb and take on all of the delicious flavours from the herbs and the flavour will run all the way through the meat. In a bowl, or freezer bag, place the lamb, oil and herbs, seal and massage gently into the lamb. Place in the fridge and leave to marinate over night. Remove from the fridge an hour before you’re ready to cook, to bring the Lamb up to room temperature..
3 Chicken Caucus’s – Either save these in your freezer after those weekly tasty roasts or ask your butcher. Prepare you jus the day before when you’re prepping your lamb, as this take a while to make, but it’s well worth it as the taste is incredibly rich and meaty. Roast the Chicken and Lamb bones in a 200ºc oven for 40 minutes. This will colour the bones and draw out any excess fat. Discard of the fat and add the onion, celery, garlic, carrot, tomatoes, mushrooms, bay leaf, thyme and cover with water. Place over 1 or two hobs, depending on the size of the pan and bring to the boil, before simmering for 10 hours. During this time, every hour or so, remove any fats or impurities that rise to the surface. If it reduces too much, keep on toping up with water, to make sure the bones are constantly covered. Pass the liquid through a muslin cloth, discarding the bones and vegetables and saving any liquid into a heavy based sauce pan. To the liquid add red wine and red current jelly. Reduce by two thirds, by simmers for around 2 hours until it’s thickened and gravy like. Test this by placing a little bit onto a plate. To finish, pass through a fine sieve. This recipe will make enough for around 10-12 portions. To store and left overs, freeze into ice cube moulds and remove from the freezer when you’re ready to use. Artichokes are one of the most delicious under-utilised vegetables that we have here in Lincolnshire. 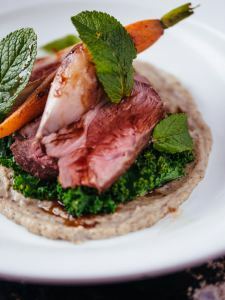 They’re grown in the masses to feed to incredible amount of of game we have in the county and hold a beautiful earthy texture that will compliment the sweetness of the lamb beautifully. Lightly scrub the artichokes with a scourer and dice. Gently fry in 25g butter for 5 minutes to soften before adding the milk and topping up with water to cover the artichokes. Bring to the boil before reducing to a simmer and cook for 40 minutes until soft. Add the remaining butter to the artichokes and blend to a purée. Leave to one side until you’re almost ready to plate up, when you’ll need to rehear the purée. 10 mint leaves, chopped. Do this with a sharp knife to avoid bruising the edge of the leaves. Place the egg yolks into a glass bowl and leave at room temperature. Place the vinegar, shallot, bay leaf and peppercorns into a shallow pan and reduce to half. Whisk the egg yolks, slowly adding in the vinegar and place into a bain-maries, whisking over a gentle heat for around 5 minutes until the yolks turn pale. Still whisking, gradually pour in the butter, a little at a time leaving the separated butter salts to one side. Once thickened, and you have the consistency of hollandaise, remove from the heat and add the fresh mint, before leaving to one side at room temperature. The vegetables are best cooked individually and left to one side once cooked. These can be heated up for a minute in a pan once you’re ready to serve. Place the shallots into a pan of boiling water and cook for two minutes. Remove from the water and leave to cook on a paper towel. Repeat this process with the carrots, cooking for 4 minutes and the Kale for 1 minute. To prepare the potato, peel and thinly slice into crisps, before heating up a deep pan filled with vegetable oil and frying until golden. Sprinkle with sea salt and leave to one side, as these will be served cold. Place the seasoned lamb in a hot smoking pan with a drizzle of oil. Place skin side down and cook for 2 minutes before placing in a 160ºc over an cooking for a further 10 minutes. Remove from the oven and add the butter, garlic and rosemary, making sure to baste the lamb with all of the juices in the bottom of the pan. Do this for around 2 minutes over a medium heat before leaving to one side to rest at room temperature for around 5 minutes. Once you’re ready to plate everything up and serve, gently warm up your hollandaise, jus and artichoke purée whilst placing the lamb back onto a medium heat. Add the carrot, shallot and potato into the pan with the lamb and baste with all of the delicious juices. Discard the rosemary and garlic clove and you’re ready to plate up. To plate, place a smear of artichoke purée into the middle of the plate and top with kale. Generously slice the lamb and place on top of the kale along with the carrot and shallots. Drizzle with the warmed up jus and in separate bowls, serve a helping of the hollandaise along with the potato crisp, which add a great texture to this dish.